Believe it or not, ever since I was young I had always loved spaghetti squash. My mom would make it for me all the time and I never payed attention to how she did it because...well...she made it so good, why would I pass up hers to make it on my own? PS Thanks mom! -After they are done cooking (a sharp knife should be able to slice through the skin with little resistance) flip them over with your oven mitts still on. -Use your fork to graze over the top pulling out all the seeds in each piece. -This is the yummy stuff that you want to put in a bowl or Tupperware. 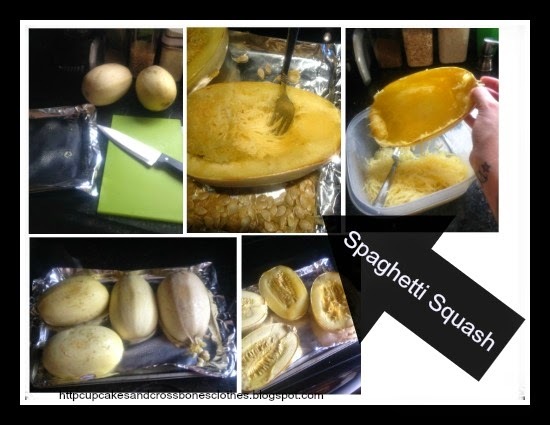 As you scrape you will be creating yummy strands of squash that look like, you guessed it....spaghetti! You can top your squash with anything from marinara sauce to grilled chicken...whatever tickles your fancy. My favorite way to top it is by mixing in some butter, garlic, salt and pepper, and a little bit of ricotta. Oh my gosh is it delicious!!! Have you made spaghetti squash before? Are you as big of a fan of it as I am? P.S. Head over HERE to see who our May Designs May Book giveaway winner was! We will contact you shortly with all the details if you were the big winner. I actually like it plain too! It really has such a great taste to it. one day i will try spaghetti squash! it just seems like a lot of work to be honest, and i am all about the lazy. looks yum though! I love spaghetti squash though I usually boil mine. So yummy! I've never tried boiling it before, I have to try that out. That's what I say every time I make it! It's the best!